The Gordon Flesch Company Earns Canon’s Top Dollar Volume Award as Canon U.S.A.’s Largest Independent Office Technology Dealer | Industry Analysts, Inc.
July 24, 2018 Madison, WI ‑ The Gordon Flesch Company is proud to announce that Canon U.S.A. Inc. has acknowledged that the company is the nation’s largest independent office technology dealership of Canon office technology hardware. 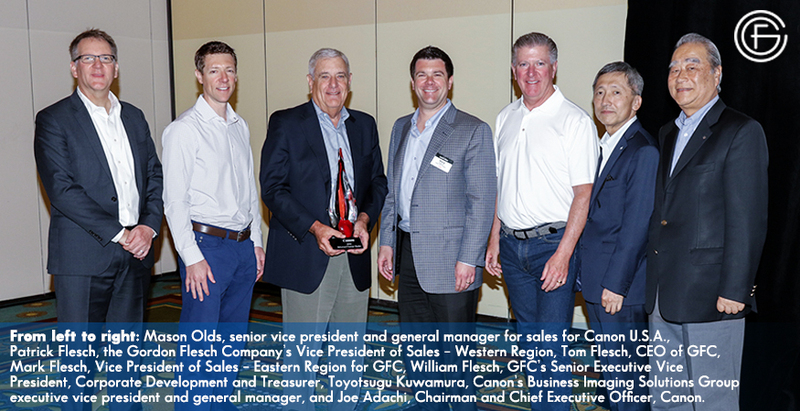 Canon has awarded the Gordon Flesch Company the “Top Dollar Volume Award” for 2017 in honor of this achievement. The Gordon Flesch Company is one of the largest independent providers of office technology solutions in the nation. Family-owned since 1956, the Gordon Flesch Company employs more than 600 people throughout 26 offices in the Midwest, with their corporate office in Madison, Wisconsin. They deliver unique business process expertise to solve challenging problems and achieve organizational goals. This includes integrating industry-leading software and hardware to build custom solutions that are supported by technical expertise, customer service and flexible, in-house financial services. Follow us on Twitter at @GordonFlesch. Canon U.S.A., Inc., is a leading provider of consumer, business-to-business, and industrial digital imaging solutions to the United States and to Latin America and the Caribbean markets. With approximately $36 billion in global revenue, its parent company, Canon Inc. (NYSE:CAJ), ranks third overall in U.S. patents granted in 2017† and is one of Fortune Magazine’s World’s Most Admired Companies in 2018. Canon U.S.A. is committed to the highest level of customer satisfaction and loyalty, providing 100 percent U.S.-based service and support for all of the products it distributes in the United States. Canon U.S.A. is dedicated to its Kyosei philosophy of social and environmental responsibility. This entry was posted in Canon and tagged canon, Gordon Flesch by IA Staff. Bookmark the permalink. ← Previous Previous post: uniFLOW Online, Online Express Comparison. See The Differences!